Town & Country is finished! It came out the right size from measurements taken with sister this Christmas. All that is left is to wash and block and send it off. Very happy with the color, the Cascade 220 wool and the finishing. Here's hoping she gets a lot of use out of it before hot weather hits Virginia. Not sure what is next for knitting. I'm slowly working on Joe's "Shalor" but I think there is a problem with the sleeve size. Might have to rethink how I'm approaching that one. 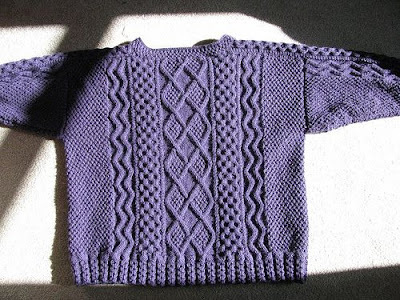 Also anxious to get another stranded work on the needles and am looking at "Lismore", a Starmore pattern. I managed to pull all the J&S substitute colors from stash so maybe that is a sign to go for it? My colors are a tiny bit more subdued in the reds but I haven't swatched yet so not sure if my reds will go in there or not. 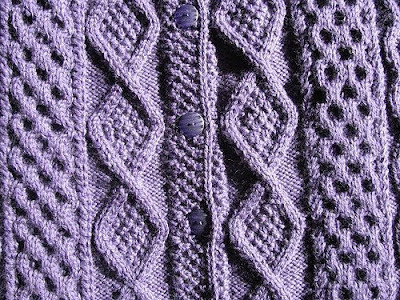 This photo is of Junieanne's Lismore in the original Starmore yarns and colors. Town and Country is gorgeous! I'm totally re-evaluating where it is in my queue. You picked perfect buttons too. Don't know if I'd be able to part with that one if I were you. this is one lovely classic. i am sure it will get a lot of wear. and the lismore is ab fab too. Town and Country is both gorgeous in the original meaning of the word, richly decorated, and certainly gorgeous as currently used. Your project inspired me to buy "A Fine Fleece" during the recent KnitPicks book sale and I'm not disappointed. Looking forward to seeing your next project! Absolutely stunning! 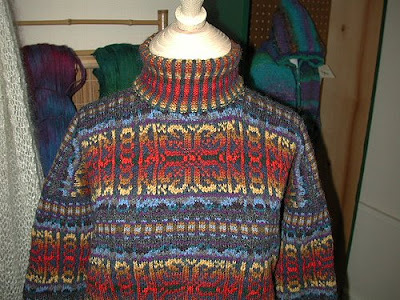 Wow - you sure had a lot of J&S in your stash and I love the color combinations.